Lindenhurst, New York, USA. September 23, 2018. 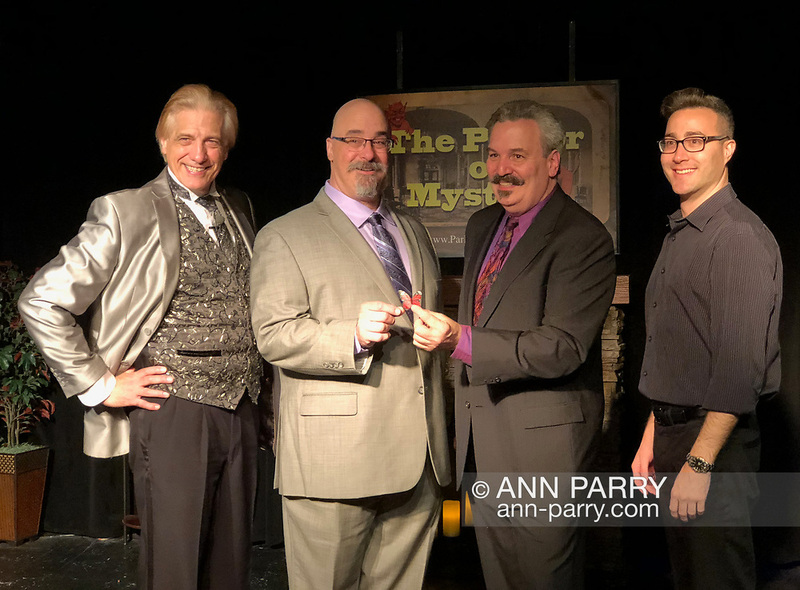 Magicians (L-R) RJ LEWIS, JOE SILKIE, BOB YORBURG, and DAVID ROSENFELD pose after performing in Comedy Magic Show presented by The Parlor of Mystery and South Shore Theatre Experience. Bob Yorburg, AKA Professor Phineas Feelgood, is a master wood carver and used unusual props in show. RJ Lewis, who sang song at start of his magic set, appeared in Broadway musical 'Barnum.' David Rosenfeld performed close-up magic and mentalism. Joe Silkie, the Parlor of Mystery producer, hosted show, and constructed and used custom magic props.